The Carroll A. Deering was built in the bath shipyards in 1919. She was a 5 masted Schooner made to run coal. She was returning from a run to Rio de Janeiro, Brazil, when she sailed into the seas of mystery. She had left Norfolk, VA in August of 1820, for Rio. She had to put in at Lewis , DE to pick up a new captain and first mate, as sickness struck down the regular pair. Her new captain was W. B. Wormell, a retired 66-year-old veteran captain. Charles B. McLellan was hired on as first mate. They were not a match made in heaven. She made Rio without incident, unloaded and was on her return trip by December 2, 1920. The friction between her captain and 1st mate was growing. By the time the made a replenishment stop in Barbados the 1st mate made threatening remarks to the captain, and was tossed in jail. They seemed to bury the hatchet, the captain bailed out the first mate and they set sail for the final leg of the return run. They were never seen or heard of again. The Deering was seen on January 28th, by the Cape Lookout Lighthouse ship. Captain Jacobson noted the crew was milling about on the fore deck, which was odd as they were usually not allowed there. He reported a thin red haired man with a foreign accent reported the loss of anchors. The radio was out on the Lightship, so he was unable to report the strange situation. She was next spotted on the 31st run aground on Diamond Shoals, off cape Hatteras. Due to bad weather, the Coast Guard was not able to get assistance to the stricken ship until Feburary 4th. When the rescue party on the cutter Manning approached the ship, they were worried by the lack of greetings. They boarded the ship to find her completely deserted, there were foodstuffs being prepared in the galley for the next meal. However all the Navigation equipment, ships log, crew’s personal effects and the ships log were all gone. Two of the ship’s lifeboats were also gone. The Manning attempted to salvage the ship, but she was stuck fast. They used dynamite to scuttle the Derring to prevent her from becoming a hazard to navigation. The crew did not come ashore in any of the nearby towns, as a matter of fact, the crew completely disappeared. Here is where the story takes an odd turn. The Deering was not the only ship at this time to have mysterious things happen about her. Several ships in the area all disappeared without a trace. This prompted a massive investigation involving five different departments of the American government (Commerce, Treasury, Justice, Navy, and even the State Department) launched investigations, each with their own theories that ranged from simple mutiny to piracy to rogue waves and even to a Communist plot. A raid on the headquarters of the United Russian Workers Party (a Communist front group) in New York City turned up some potential clues. The government officers found papers that called on members of the organization to seize American ships and sail them to Russia. These papers also showed a link to several shipboard strikes the previous year. However the link was circumstantial at best, and never turned into definitive proof. Some of the furor died away when it was realized many of the missing ships were in the vicinity of a series of hurricanes and tropical storms. 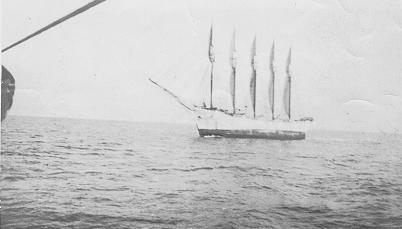 However the Deering and the sulfur freighter Hewitt were sailing away from the storms and should not have been affected. Piracy and mutiny were both theories that were advanced over the years. They also point out Rum-runners due to probation could have had a hand in the events. No official explanation has ever been given and no trace of the crew has ever been found. The investigations by the government were closed in 1922, and that is how they remain to this day. Our Nightwatch Paranormal investigations will hopefully revel some further details of this interesting story.